Visit Barcelona if you're looking for a holiday which includes sight-seeing, architecture, history, religion, entertainment, city life, oh... and the beach!!! Yes that's right - Barcelona does have everything!! Most would even argue that the second capital of Spain actually has much more to offer to the average tourist than the capital itself. Although Catalan and Spanish are the official languages of Barcelona, due to the massive amounts of tourists that visit every year, most shop assistants do speak English, so you shouldn't have any problems when communicating with the locals. As the most famous street in Barcelona, this busy tree-lined street contains flower stalls, pet stalls, news-stands, painters and is the home to the popular street human 'statues'. Planned as a housing estate and designed by Gaudí, only two houses were eventually built. However, the typical Gaudí architecture and 'el drac' (dragon) make this site well worth the visit. Free entry. 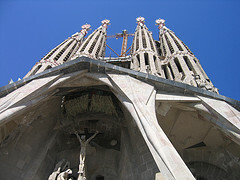 The Temple Expiatori de la Sagrada Família was Gaudí's life-work but still remains unfinished. Work on the church continues today, following Gaudí's original plans closely, using mosaics and natural symbolism. Admission is 10 euros/adult + 2 euros lift to the top (well worth it). 2 miles of promenade and beaches were created during the rebuilding for the 1992 Olympics. Port Olímpic boasts a 'lively' nightlife area popular with hen and stag dos. A little closer to La Rambla is Port Vell, containing a new shopping area, IMAX cinema and one of Europe's largest aquariums. The Gothic cathedral has many attractions but make sure your shoulders and knees are covered or you will not be allowed in. Visit when a service is not in progress and you can see the intricate 15th century choir stalls. You can also take a lift to the roof for good views. The Passeig de Gràcia leads from Placa Catalunya up through the Eixample district and holds many big-name shops. However, you can also find several architecturally interesting buildings on there, such as La Pedrera, Casa Battló and Casa Lleó Morera. Visit the home of FC Barcelona to take a tour of the stadium and visit the Club Museum, to admire the photos and trophies of the club and to reminisce about some of the greats such as Maradona. Full tour - 13 euros/adult. A short walk from La Rambla, places on the tour should be reserved (although we just turned up and were ok). The highlight is the central stained-glass dome in the concert hall. This is the only concert hall in Europe lit by natural light. 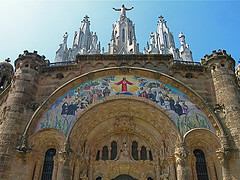 The Temple Expiatori del Sagrat Cor (Church of the Sacred Heart) can be found at the top of Mount Tibidabo. You need to take a train, a tram and a funicular to get there, but it is worth it. A lift carries you to the top, just under the feet of Jesus. (Click on the blue markers to see the numbers and names of the sights which correspond to the list above). 1) Remember your passport - even when travelling by land! 2) Keep hold of your wallet! There are many pickpockets in Barcelona. Watch out for crowded tourist areas such as in front of the Cathedral and down La Rambla. 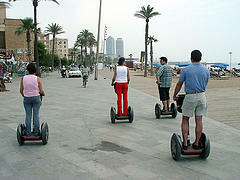 There are many ways of travelling around central Barcelona to view the TOP 10 sights and more. 1) Walking. Whenever I have been to Barcelona, I have always walked as much as possible because you see so much more of the city and there is always the possibility of veering off from your originally planned course to walk down an interesting little street in the Old Town or stop to admire a work of Modernism (or visit a handbag shop!) on Passeig de Gràcia. Grab yourself a great Barcelona guide book and get walking! IMPORTANT: Wear comfortable shoes and take blister plasters with you!!! 2) The Metro. To get to those sights which are just a bit too far to walk (e.g. Parc Guell), the Metro is a cheap and easy way to get there. The cost for one journey is 1.35€ or a day ticket for zone 1 is 5.80€. For a full guide to the types of travelcards and their costs. All decent guides will contain the metro map (if not, click here) and most places of interest have a metro station within walking distance. ADVANTAGE: Cheap and quick way to travel. DISADVANTAGE: Whilst you're underground, you're not seeing Barcelona! 3) Bus Turistic. For those who want to be handed Barcelona on a plate, the Barcelona Bus Turistic is for you. With 44 tour stops, you can jump on and off the bus as many times you like. Click here to get a -10% discount when buying on-line. ADVANTAGE: No planning needed, just jump on the bus and see the most famous sites. DISADVANTAGE: No independence. (VIDEO BELOW). 4) By Bicycle. Many bicycle tours are operated around Barcelona to take you to the key sights. Click here for a site offering group bicycle tours, individual bicycle tours or simply bicycle rental if you want to do your own thing. ADVANTAGE: Quicker than walking! DISADVANTAGE: Some areas of Barcelona are quite crowded and it could be tricky to manoeuvre a bicycle through the throngs. 5) By Segway. For a 1 hour or 2 hour tour of some part of Barcelona by the ever increasingly popular mode of transport, the Segway (see pic to right). 1 hour tours cost 30 euros and 2 hour tours are 60 euros. ADVANTAGE: Save your legs! DISADVANTAGE: Limited sites visited on the tour. (VIDEO BELOW). For a printable guide to Barcelona, visit Barcelona life. Another very helpful source of information is the Barcelona Spain Travel Guide a practical and informative tourist guide about Barcelona City and beaches. Budget oriented, for tourists and business visitors. If you want to be based in the middle of the hubbub of Barcelona, I would advise that you stay at one of the hostels/hotels near La Rambla. Within walking distance of Placa Catalunya, Passeig de Gracia and its Gaudi buildings, the Cathedral, Port a Colom, the port, etc., this really is the best place to be if you want to experience true, noisy Barcelona. However, if you do not sleep well or are looking for a more upmarket hotel, you may wish to look slightly further afield. As long as the hotel is near a metro stop in central Barcelona, you are usually only a few stops away from some exquisite architecture or some great Catalan food. TIP: Check the nearest metro stop and the metro plan before you book. Hotel Condal: When we went to Barcelona in August 2008, we stayed at Hotel Condal, 30 seconds off La Rambla. The double room had a private bathroom included. If you only need a place to sleep at night-time, this hotel is great. The rooms and amenities are basic but that is all we were looking for. This is a fantastic example of a fairly cheap hotel in a central location which allows you to see Barcelona on a budget. Alternatively, check out the holiday apartments available on apartamentos.es: spacious, modern (in some cases, even modernist!) apartments available. These are particularly advisable if you are travelling in a large group or if you prefer more space than the average hotel room provides. There are hundreds of eateries in Barcelona - so your only problem will be choosing which one you prefer! Generally speaking I would not advise eating on La Rambla as it will be very expensive, it is a bit too busy and you will need to constantly watch your bag (although the part of La Rambla above Plaça Catalunya is nice, but still pricey). Plaça Reial (off La Rambla) is a great place to sit, eat tapas and watch the world go by but again, it is quite expensive. 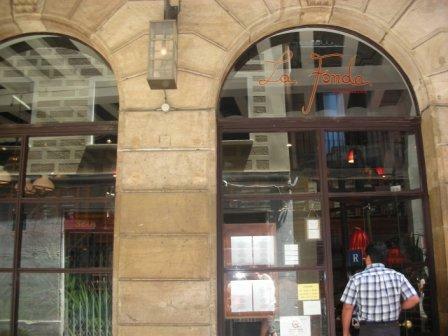 1) La Fonda - hugely popular with tourists due to its cheap prices, get there early and expect to queue. Do not expect traditional cuisine or local service but do expect good food for great prices. Open every day between 13h00 - 15h30 and 20h30 - 23h00. 2) Buenas Migas - a popular chain in Barcelona with 7 cafes, serving a variety of breakfasts, tapas and focaccias. Expect naturally tasty food and good prices. 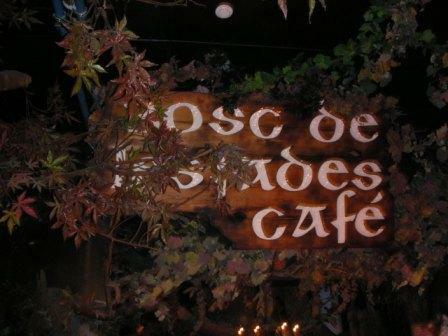 3) Bosc de les fades - part of the Wax Museum, the Bosc de les fades is primarily a bar but also serves tapas. I have never been to a more magical cafe in my life. Located near the bottom of La Rambla, it is well worth a visit! For a full guide to eating in Barcelona, click here. 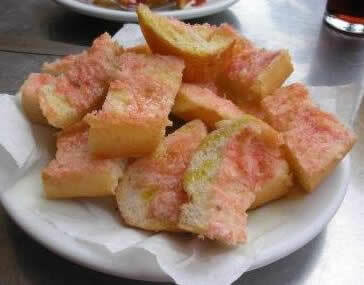 1) PAN CON TOMATE (in Catalan - PA AMB TOMAQUET or PAN TUMACA).